Monoclonal antibodies that have been properly validated will recognize only a single epitope of an antigen and are extremely specific. Polyclonal antibodies, on the other hand, recognize multiple epitopes of an antigen. They’re a mixture of antibodies. Sometimes polyclonals are the only choice, for example when a hot new target is under investigation and there hasn’t been enough time to produce and validate a monoclonal. But much of the time, you’ll have a choice to make – mono vs. poly. New to ChIP? Not sure where to start? Read the tale of one scientist's journey from ChIP novice to ChIP master: Keep CHiP'ing Away. One of the perceptions about polyclonal antibodies is that the recognition of multiple epitopes improves the chances of pulling down the target protein in ChIP when epitope accessibility is a concern. In reality, this is the case only if a recombinant, full-length protein was used to generate the poly. 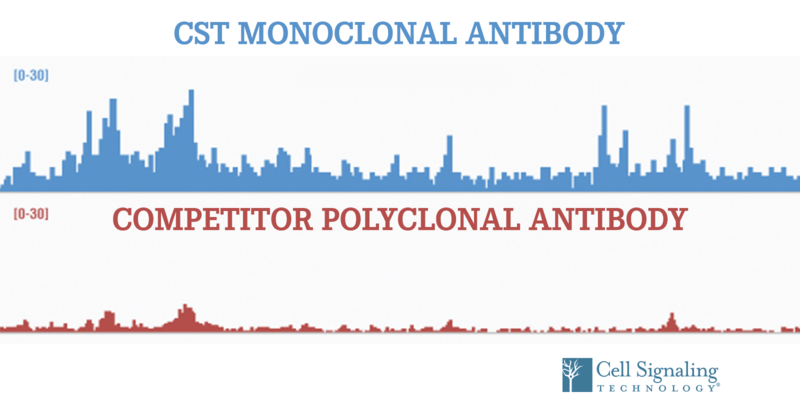 Many polyclonal antibodies for ChIP (particularly modification state-specific antibodies) are generated against peptide antigens that are only 20-40 amino acids long. This means fewer epitopes than you might expect, and the epitopes are likely to overlap with each other. In short, you’re not likely to receive the benefits of “multiple epitopes”. Can you afford lot-to-lot variability? There’s another crucial consideration for all polyclonal antibodies: there is a chance that one or more species in the polyclonal mixture will cross-react with off-target proteins, leading to background signal. When testing a polyclonal antibody, you might find that the background is acceptably low. However, the problem with polyclonals is that the molar ratio of individual antibody species, and hence the overall specificity of the polyclonal mixture, will vary from one lot to another. Consider each polyclonal antibody lot to be a limited resource, because the next lot may have different performance characteristics. There is good news, however. Thanks to their, well, monoclonality, monoclonal antibodies offer much more consistent lot-to-lot specificity. This is applicable to ChIP experiments as well as other applications. And unlike polyclonal lots, monoclonals (including recombinant rabbit mAbs) are renewable resources. In a recent paper published in Epigenetics & Chromatin, investigators at the Broad Institute performed a systematic investigation to compare mono vs. poly performance in ChIP-seq. Four key histone modifications were selected for analysis. The performance of monoclonal antibodies was highly correlated with that of polyclonals for both genome-wide and region-specific read counts, and the authors concluded that monoclonals could substitute for widely-used polyclonals and improve reliability (for the reasons of consistency and renewability mentioned above) and simplify interpretation of ChIP-seq datasets. Bear in mind that consistency and renewability are valuable only if the antibody has been validated. Antibodies made at CST are rigorously validated across applications including ChIP. Their specificity is tested using relevant methods and model systems, including but not limited to, inhibitor/activator treatment to modulate upstream signaling; negative, positive, and overexpressing cell lines; and genetically manipulated knockout/knockdown cell lines. It’s not surprising, then, that the most popular CST reagents for ChIP and ChIP-seq are recombinant monoclonal antibodies.